Today was my first day branching out of Seattle a bit and exploring more of Washington state. To fuel my adventuring, I started out by getting some coffee at a cool artsy coffee shop in Bellevue called Cafe Cesura. They were very friendly, there was cool art on the walls, and the coffee was on point so I felt ready to do a bit of drivin’. My first stop was to explore a little chunk of the massive Mount Rainier National Park. The park covers an expansive 236,381 acres (369.3 sq mi) including all of Mt. Rainier itself. Rainier is 14,411 feet tall, making it the highest point in Washington, and it’s also one of the largest active stratovolcano in the world which is vaguely terrifying. Interestingly, despite being filled with lava the Mountain is also known for having the two largest glaciers in the contiguous US on it which gives you an idea of just how ecologically varied this big ol’ park is. I was so overwhelmed by the natural beauty I had to take a little nap in the parking by the ranger station (that’s why, I’m sure). Fully rested, I then when on a short but visually stunning hike through the woods. I think I’ve said this a couple times since hitting the northwest, but this is at least the third time my concept of how green a place could get has been totally shattered. It was not a long hike, but it was one of the most jawdropping trails I’ve ever been on, with new insane views around every bend. The Carbon River itself was very pretty but in a bit of a low point water level wise because, even though everything was bright and verdant, the ice had only recently started thawing. After getting all that good fresh air, I went to check out one of Washington’s other major cities, Tacoma. Tacoma is definitely smaller than Seattle, but it still has a city vibe with a little bit of college town thrown in for good measure. The woman’s magazine Self also named them “Most Sexually Healthy City” in 2006. I have no idea what that really means, but they’ve got that going for them. Naturally I started out by getting some coffee. I went to a funky college cafe called Metro Coffee which was housed in a lovely brick building with an outdoor patio and made for a great place to sit and sip some good coffee while enjoying a great day. 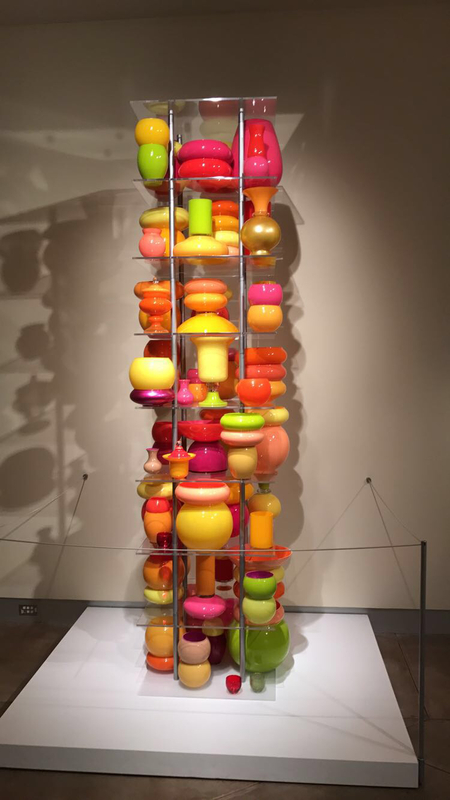 The thing I was most excited to see was Tacoma’s Museum of Glass, a museum dedicated to artwork made out of glass and celebrating Tacoma’s special role in the studio art glass movement of the 20th and 21st century as the birthplace of one Dale Chihuly. The museum began development at the same time as a project to redevelop the city’s waterfront area, and it became an architectural focal point of the beautification effort leading to an incredible building designed by Canadian architect, Arthur Erickson. The museum and the waterfront renovations have proven to be a success leading to greater community engagement and aiding in an economic turnaround for the city. Probably the most distinctive feature of the museum building is the striking 90 ft. tall steel plated cone Hot Shop where glass artists work and lead demonstrations. I think by this point in the blog I’ve made it pretty clear that I am a sucker for glass art, because molten glass is just such an improbable (and dangerous) medium to do the things artists are able to do with it and the finished products always have a sort of magical quality to them, so rest assured I was pretty excited. 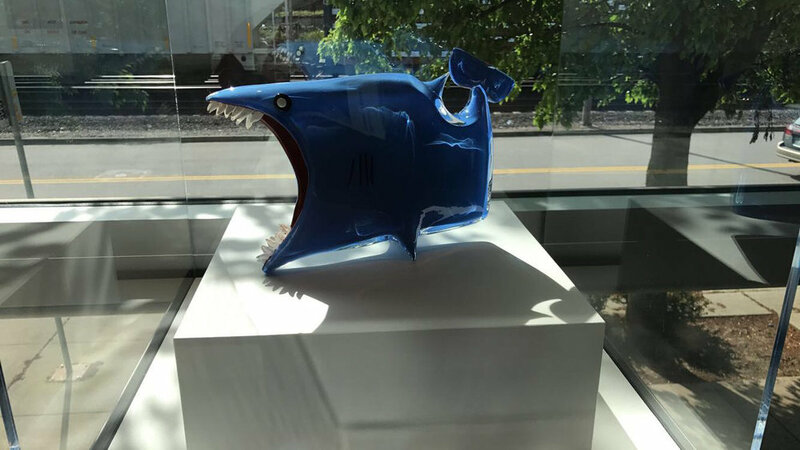 The first exhibit in the lobby was of works from a former Artist-In-Residence at the museum, Akio Takamori. Takamori rose to prominence as an innovative contemporary ceramics artist who pushed the boundaries of what the medium was capable of with stunningly realistic ceramic portraits that also had a light cartoon-y touch to them. While in his residency at the Museum of Glass, he started a project inspired by ancient Roman head-shaped flasks. Takamori used his own ceramics as molds for the glass vessels, and then painted over the glass with enamel paints that played with with transparency of the medium. This lobby exhibit featured both some of his classic ceramics and his newer glass works, and everything was really incredible (particularly his serene sculpture of a sleeping woman). The next exhibition was a study in contrasts with the sculptures of Albert Paley. 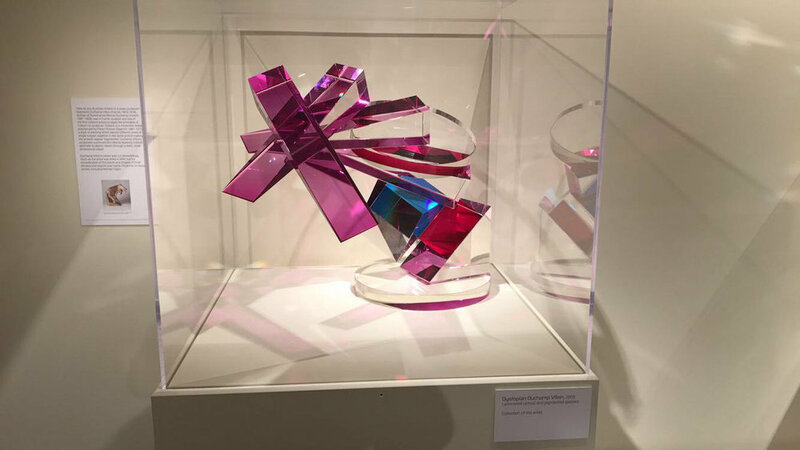 Paley is most known for large scale public sculptures using different metals, and this gallery collects works of his that blend those metallic sculptures with works in glass. The artist makes an interesting point that working with glass and metal is very similar in that both materials become malleable at high temperatures, but the end results couldn’t look more different with the glass being delicate and see through and the metal being tough and opaque. He plays with the contrasting nature of the materials with abstract sculptures that swirl and spike in all directions in physics defying ways, like explosions caught in still images. Aesthetically they didn’t all do it for me, but the colors and craftsmanship were uniformly excellent and they were really not like anything I’d ever seen before. My favorite piece of Paley’s was called Divide, featuring a rod of glass, enshrouded and divided by a wave of steel. The glass looks both powerful and like it’s about to collapse at any moment, and that tension and dynamism is so captivating. Next up came the museum’s permanent collection, where I was unsurprisingly most impressed by Tacoma’s native son, Chihuly. I really should be tired of him by now but each new exhibit reaveals new color combinations, new patterns, and new shapes I didn’t know glass could make. He’s really earned his place at the top of the Glass food chain (metaphorically, please don’t eat glass). 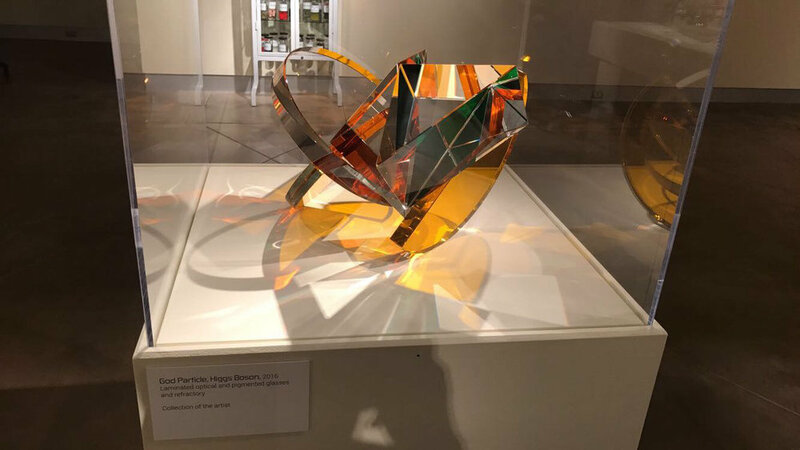 The next special exhibition was dedicated to the artist Michael E. Taylor’s whose work with glass is heavily influenced by math, science, and technology. 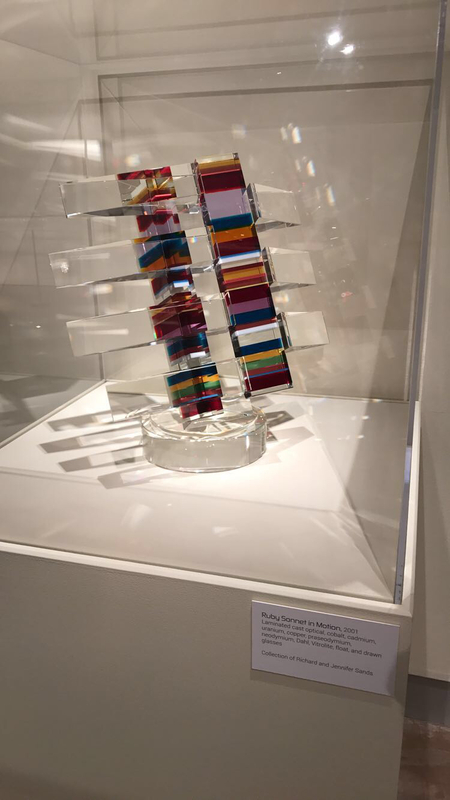 Many of his constructions seem to spit in the face of gravity, and he makes frequent use of prismatic glass to fracture light in ways that give his works shiny, constantly fluctuating colors. To walk through this gallery and watch the light bounce and play off all the different sculptures was truly breathtaking and an excellent use of the unique properties of the medium. My favorite exhibit though was ongoing Kids Design Glass gallery, a truly inspired blend of education, community engagement, and creativity. The Museum invites children 12 and under to visit and then submit designs of their own for pieces they’d like to see rendered in glass. 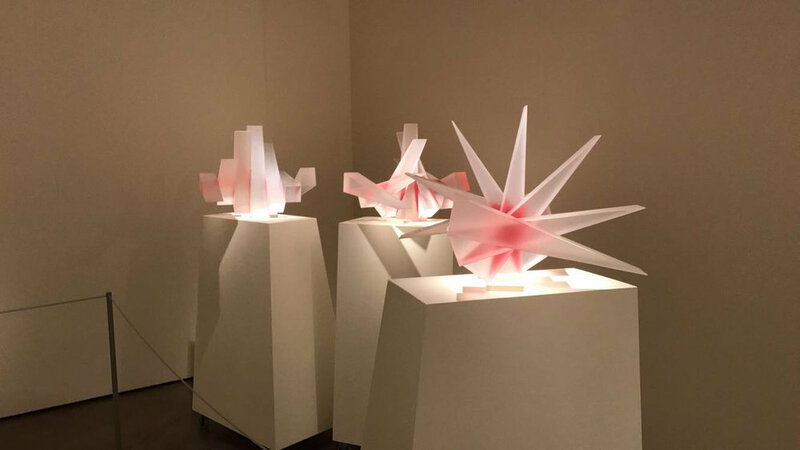 The museum’s team of glassblowers then challenge themselves to bring the kids’ drawings to 3-dimensional life in the Hot Shop as close to the the original designs as possible. 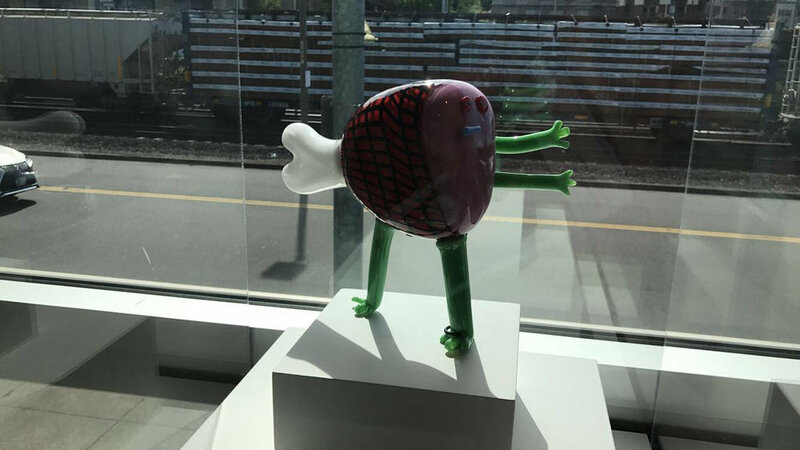 The resulting creations and their inspirations are then displayed in a gallery that is at times sweet, hilarious, and thoroughly impressive in equal measure. I love how much they just let the kids’ minds run wild, and the resulting creatures that they come up with are frequently shocking in the best way possible. The varying degrees of artistic abilities in that young age group also leads to some fantastic anatomical anomalies, that I give the glassblowers nothing but credit for non-judgmentally rendering exactly as they are on paper. The actual glass blowing was top-notch which I think makes everything just a bit more surreal, and each new display was a joyous surprise. The kids’ explanations of their own handiwork was just an added bonus on top. The way their brains work is so fascinating. As much as I loved this whole gallery, one piece in particular completely broke me and made me laugh harder than maybe I have ever laughed in an artist museum. Whereas most of the kids chose to give explanations for what inspired their drawings, young James Barr (age 7) instead gave one incredibly short and unhelpful comment on his design for the spectacular Hamburger Cowboy, just “I read about it”. Where did he read about it? What spoke to him about it? How did a Hamburger rise to the rank of sheriff? These are all questions James doesn’t care if you know the answers to, and I absolutely love that. The wonders of the museum aren’t limited to its interior, and outside the museum building are several reflecting pools with large scale installations of translucent organic sculptures designed by artist Martin Blank and created in the museum’s Hot Shop. The piece is called Fluent Steps, and explores the interplay of the water, glass, and natural light in truly awe-inspiring fashion. The pieces are all stationary but somehow it just seems to dance. Last but not least was the museum’s Bridge of Glass which connects the museum to downtown and was designed in collaboration between the architect and Chihuly. 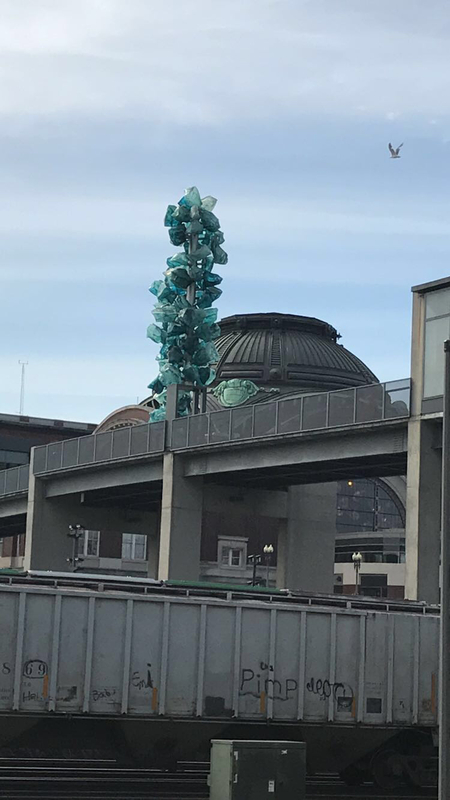 I wasn’t heading that way so I didn’t actually walk on the bridge, which is filled with Chihuly pieces, but it would be hard to miss the magnificent sea-green Crystal Towers that extend 40 ft up from the bridge, adding some color and character to the Tacoma skyline. After all that glass, I got some more coffee at a local spot called Bluebeard Coffee Roasters located in spacious beautifully renovated older building in downtown Tacoma. It had a real calming hang out vibe, and some great coffee. At this point though, I was feeling pretty hungry so I went to a Northwest staple, Duke’s Seafood and Chowder, which while technically founded in Seattle has since become a Tacoma institution as well. 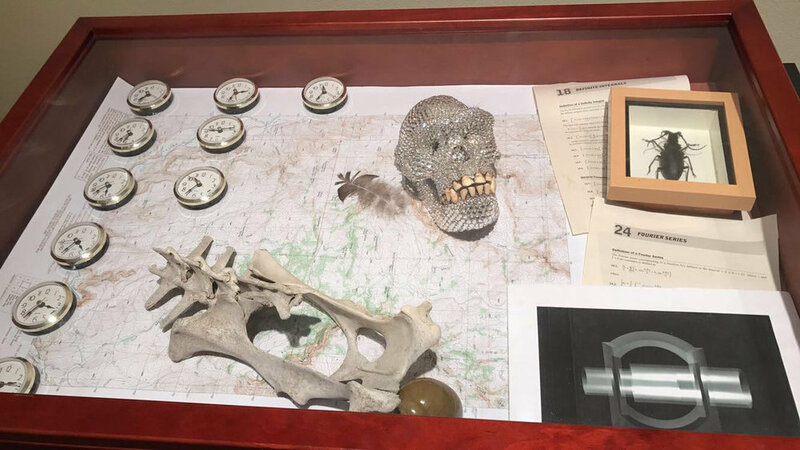 I knew I was going to like the place right away because right up front they had a whale skull with googly eyes, a monocle, top hat, and cane labeled Moby Duke. If I wasn’t already smitten with that fancy pants whale, my heart was completely stolen by the fact that the restaurant offers something I never knew how much I needed in my life: A Chowder Flight. I got the Triple Dinghy flight which came with three 2 oz. samplers of their different award winning chowdahs, and a massive hunk of flaky golden homemade sourdough bread. For my chowders, I got the classic clam (which one Seattle’s Chowder Cook-Off three years in a row before being asked to not compete any more), the North By Northwest Seafood Chowder featuring Wild Alaska Salmon, Halibut, Cod - cioppino style, and a Lobster Pernod Chowder with big chunks of lobster and sweet potatoes in a creamy base. Everything was incredible, and while the bowls were small the seafood to chowder ratio was very generous so I imagine if you went for a full bowl of anything it would be very filling. I think the cioppino base was my least favorite, but that’s just because I generally don’t love tomato-based soups, and I have to say the chunks of salmon and halibut more than made up for it. The Clam Chowder was probably the best I’ve had out of New England, with a full creamy smokey flavor, but the Lobster Pernod was something new and totally unexpected with the anise, sweet potatoes, and lobster adding up to a delightfully flavorful soup unlike anything I’d ever had before. The sourdough really added to everything and was a phenomenal vessel for dipping. To wash it all down, I got the Mac and Jack’s African Amber (because I love a rhyme), which was a nice malty smooth ale. Perhaps best of all, the restaurant was right on a dock, so a short walk around the back would give you a pretty excellent view out over Puget Sound. While looking out over the water, I happened to also notice that someone had left a little E.T. action figure in a crevice of a brick wall. I don’t know if was done absentmindedly or artistically or just to be silly, but it cracked me just seeing him chilling there. One of life’s little mysteries I guess. After helping my new little friend phone home, I set sail for the night’s open mic. I was very excited because it was in a venue I had been planning on seeing before I even knew about the mic, the world Famous Bob’s Java Jive. Bob’s started out in 1927 as the dream of a dissatisfied veterinarian named Dr. Otis G. Button (please take a moment to appreciate this supremely silly name) who gave up his medical practice to open a diner shaped like a giant coffee pot called the Coffee Pot Restaurant. The 25 ft. tall pot became a popular roadside attraction and in 1955 it came to be owned by the eponymous Bob who tapped into the current Polynesian craze going on in the country by turning it into a tiki bar and surf music venue. It really took off from here, and the Ventures were even the house band for a period. Somehow it managed to survive all these years in this incarnation even as national interest in novelty buildings has dwindled, and it’s become a mainstay of the local music and arts scenes even getting registered as National Historic Site. It would have been cool to just see it in person, let alone get to perform there, and the funniest thing I learned is that they despite the exterior, they do not serve coffee. The mic itself was as fun and funky as the building and I had a really fun night. all of which was followed by a brief pause and then “My next poem…” It killed me. Sam Ellison- I was the kid who showed up early to school to hang out with the teachers. Sarah Champion- My daughter said "mom I'm not Afraid of all the dead people because they're around us all the time"
This mic also had a headliner come down from Seattle to deliver a longer set to finish off the night. Her name was Shannon Koyano, and she had some very funny material, but the thing that impressed me the most was what she was able to do right off the cuff. She did an extended bit where she “unlocked” everyone’s sets, and she did a short riff on every comic who had already gone up. I only tend to focus on the jokes that went right (because mics should be a safe spot for people to try new stuff and often fail), but rest assured like every open mic this one had some oddballs and they provided her with plenty of material to work with. It was all light-hearted though hence her use of the term “unlock” as opposed to “roast”, and she was really trying to just make sense of some of the crazier moments and see if their was any hidden potential there and she wasn’t putting anybody down even if she was going hard on some jokes (Most of the riff on me was about I how I really do look super young, which is super fair). It was pretty impressive to watch. My own set went solidly, and I tried out a new joke that actually did pretty well so I was happy with how my day in Tacoma ended up. What do you call an arrogant felon going downstairs?